We offer a wide range of packaging machines specifically designed for weigh filling, bagging, wrapping or container filling and end of line solutions baked goods. Whether it be wrapping cookies, filling granola into containers, automatically bagging croissants or case packing muffins into trays, we offer solutions for all production requirements and budgets. Our trained professionals can come to your facility and walk you through how we can further automate your bakery packaging process with solutions that make sense. Our WeighPack vertical form, fill & seal solutions are commonly installed in the baking industry to automatically package cookies, granola, crackers, pretzels, snacks and much more. We offer vertical bagging solutions for all budgets, space requirements and package sizes. 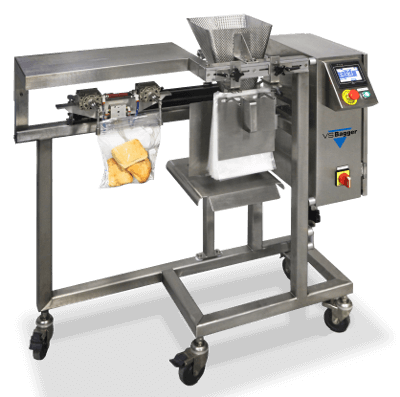 The Swifty Bagger™ for pre-made pouches is a great solution for bakery packaging applications. It is versatile and easy to use with many features that simplifies your automatic packaging process. Flow wrapping just got a lot more affordable. 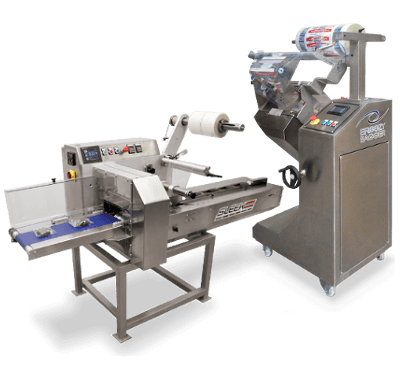 The SleekWrapper™ is a servo-driven flow wrapper with precise positioning and smooth acceleration-deceleration. Combined with clean-ability and service-ability features, the SleekWrapper™ is a dependable flow wrapper. The Breezy Bagger™ is a great fit for your bakery packaging needs because of its self-adjusting feature that seals the bag according to the volume and length of the product in the bag. It’s pivoting design allows users to operate both horizontally like a conventional flow wrapper or inclined for vertical drops. WeighPack’s solutions for wicketed bagging for bakery packaging are compact, simple, and effective.